The DJI Mavic Pro is probably the most sold drone. We looked at the little drone and tested if the Mavic Pro really does what he promises. Even while unpacking, we were surprised how small the DJI Mavic is. Compared to the Phantom series of DJI, the Mavic Pro requires much less space and weighs just 740 grams. This is unusual for a 4K drone. Clearly, DJI wanted to bring a drone on the market in 2016, which is easy to use and which one can take along well on a journey. But can the little drone also deliver the usual quality that we know from DJI? In the beginning, I was very skeptical. Fold out the propeller arms. 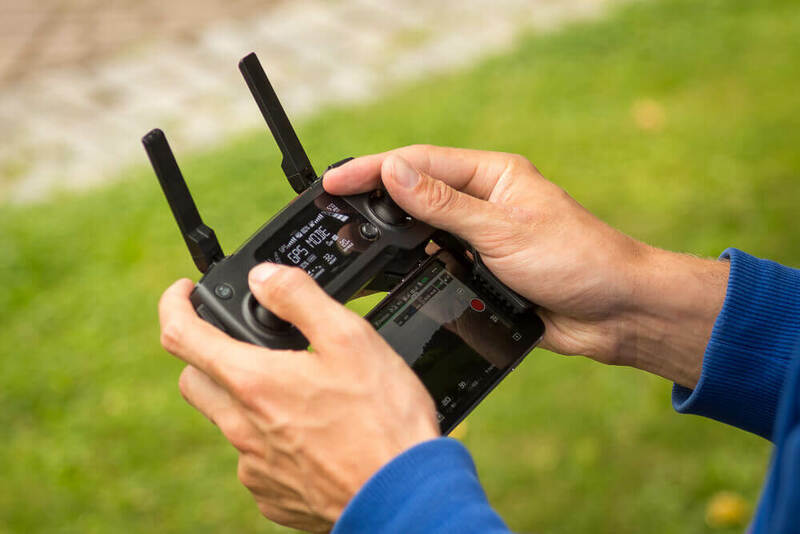 Connect your smartphone to the remote controller and open the DJI Go 4 app (optional). Screwing the rotors is not necessary with the DJI Mavic Pro because the propellers are fixed to the motors and can be folded. Once the engines start, the propellers align properly, so we can save ourselves a few hand grips. After you’ve turned on the Mavic Pro and the controller, you’re ready to go. Everything is done in less than a minute. 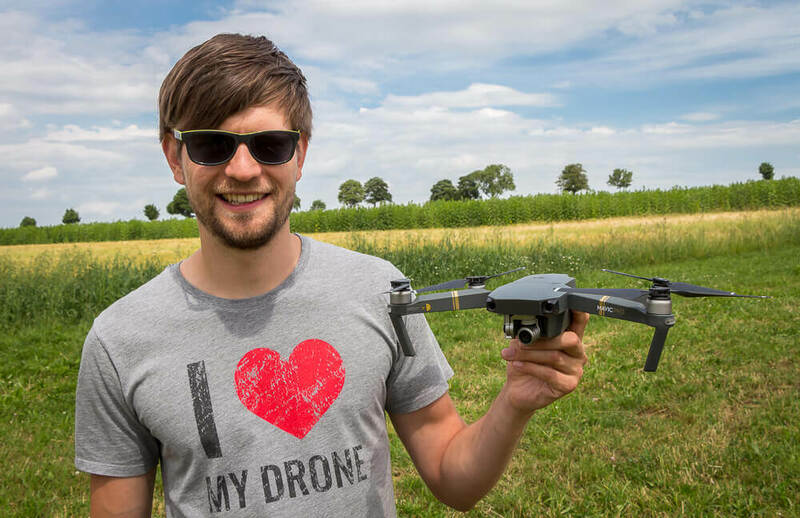 This is absolutely terrific because from other drones we know that we need five minutes or more until all components are in the right place and the remote control has made the connection to the quadcopter. So here’s the first big plus point for the DJI Mavic Pro. Barely in the air, the next surprise was waiting for me. The DJI Mavic Pro is easy to control. The commands on the remote control are implemented very precisely and there are hardly any signs of inertia. The quadrocopter stopped very fast when I let go of the joysticks. In addition, the DJI Mavic Pro was hardly irritated by the crosswinds and always kept his position. Here is the technology noticeable that DJI has installed in the Mavic Pro. In addition to the GPS data, the position of the drone is also located by the Russian GLONASS satellites. Due to the higher number of satellites, the position can be determined more accurately, which is reflected in improved stability when flying. The exact floating of the drone is additionally supported by the Vision Positioning System (VPS). Ultrasonic sensors and a camera on the bottom of the Mavic Pro control the ground and can detect unwanted course deviations. The quadrocopter can respond immediately without your reaction. This is brilliant and makes flights close to the ground very stable. This helps you during the landings, especially if you are a beginner. But in other situations too, the VPS is extremely helpful. So in buildings, you have usually no GPS reception. Even in valleys or waterfalls (great motifs) satellite reception often fails, as mountains shield the signals. With the VPS of the DJI Mavic Pro, such areas are no longer a problem! However, it must be sufficiently bright for the VPS sensors to work. The DJI Mavic Pro is equipped with a 3S LiPo battery that allows the drone to fly for about 25 minutes. I recommend you to buy at least one more battery so you do not have to charge so often on the way. We are always on the go with two to three spare batteries. If you decide to purchase multiple batteries, we recommend that you purchase a battery charger that speeds up the charging process. In normal mode (P) I reached a speed of about 35 km / h in my test. The quadrocopter flies even faster in the sports mode. In sports mode, the aircraft reacts faster to the commands and is much agiler. In this mode, I was able to accelerate the drone to a speed of about 65 km / h. That’s really fun! However, the braking distances are extended in sports mode and obstacle avoidance is turned off. So be careful and avoid areas with obstacles when using the mode. The DJI Mavic Pro features FlightAutonomy, a state-of-the-art obstacle detection system. On the front of the drone, sensors are installed, which can detect objects up to a distance of 15 meters and store them as a 3D model. The Mavic is thus able to brake in front of an obstacle and switch to hovering. 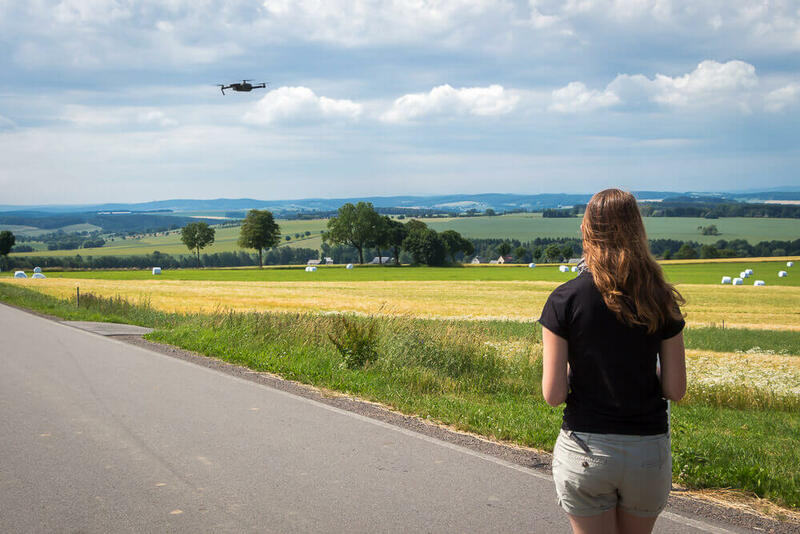 During a return to home flight, the drone can even dodge the obstacle on its own and continue the flight without collision, to return to the home-point without prejudice. The remote has been redesigned for the DJI Mavic and is quite different from the DJI Phantom or DJI Inspires remote controls. The small controller is great in the hand and all the switches necessary for flying are easy to reach without having to move your fingers. In this mode, you can easily maneuver the drone with the control sticks of the remote control. We already know the functionality of the DJI Phantom: The motors can be switched on by pulling the two control sticks down into the middle. With the left joystick, you can finally lift the DJI Mavic Pro. The display of the remote control shows all the data relevant during the flight (for example, battery charge level, altitude, and distance). However, image transfer is not possible in this configuration. For image transfer, you need to connect your smartphone to the remote via a cable. On the smartphone, the DJI GO 4 App must be installed. When you open the app, you’ll see a live image of the camera and full access to all the features of the DJI Mavic Pro (more on that below). With additional accessories, a tablet can also be paired with the remote control. If you want, you can only use the DJI Mavic Pro with a mobile device of your choice. 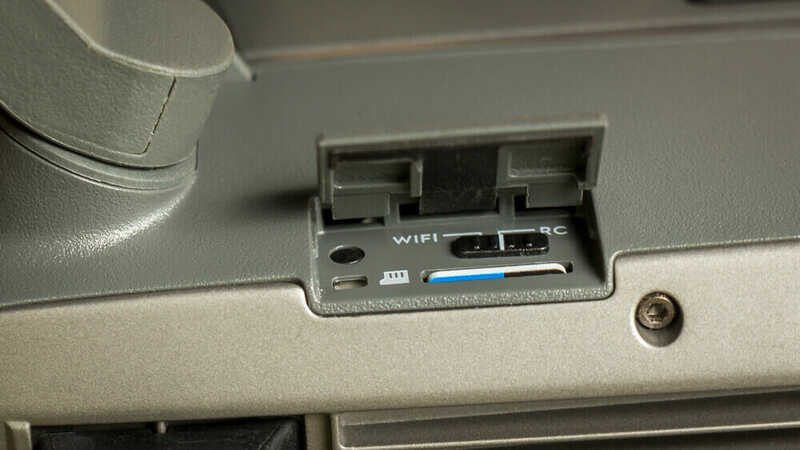 But first, you have to change the position of the switch next to the SD card slot from RC to WIFI. Finally, connect your smartphone or tablet to the DJI Mavic Pro wifi. The access data can be found on the sticker, which is located under the battery. I recommend that you save the password in the notes of your mobile device before you turn on the DJI Mavic Pro. The remote control of the DJI Mavic Pro feels very comfortable and it is fun to maneuver the quadcopter with it. However, there are also two small disadvantages of the remote control: On the one hand, the smartphone holder hides the home button of my iPhone. That could be improved in any case. On the other hand, the smartphone is folded under the remote control, making it very challenging to install a sunscreen. Especially in bright light conditions, it is thus difficult to see something on the display. Anyone who takes his drone on trips to southern areas will know what I am talking about. In our test of the DJI Mavic Pro, we also had several problems with the image transfer. Even though the remote control was connected to the Mavic Pro, I no longer had any connection with the DJI Go app. We used the Apple iPhone 6 for the test. We got this issue under control by not using the DJI cable on the side, but have our regular Apple charging cable connected to the bottom USB port. With this simple trick, we had no more difficulties with the image transfer. Other users turn on the flight mode to get the problem fixed. With the DJI Spark, the Chinese market leader has brought the issue of gesture control on the agenda. The DJI Mavic Pro also benefits from the new technology. 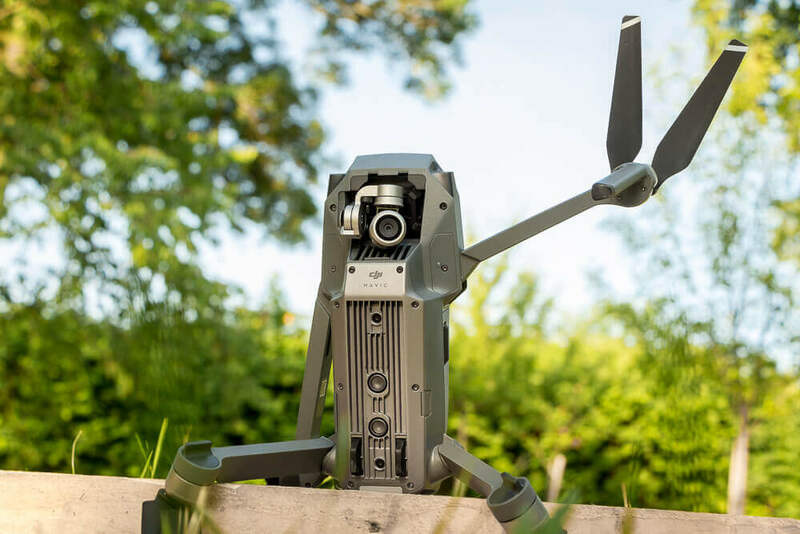 By lifting the two arms sideways, the DJI Mavic Pro starts to track the person. 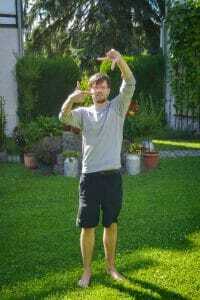 By making a rectangle with both hands, the drone counts down a countdown and finally takes a picture. Both gestures are pretty cool for beautiful selfies. I can well imagine that we can look forward to many more ways of gesture control, which DJI will implement via firmware updates in the future. It remains exciting! It’s really cool that you can launch and land the DJI Mavic Pro directly from the palm of your hand. However, that needs a bit of explanation. In the DJI Go 4 app, there is a button with which the drone automatically launches or lands. To confirm the commands, a swipe movement is still necessary on the smartphone. Of course, this is not very practical if you hold the remote control in one hand and the Mavic Pro in the other. That’s why you should start and land completely with the remote control. Simply place the Mavic Pro on a palm to start. With the other hand, drag both sticks down to the middle. This is a bit complicated, but not impossible. Maybe your friend can help you with starting the quadrocopter. As soon as the propellers are turning, you move the left control stick up and the DJI Mavic Pro flies to the sky. If you want to land again on the palm, let the drone hover a few feet above you and raise your hand under the Mavic Pro. The sensors on the underside should then ensure that the Mavic Pro flies up a little bit to maintain a safe altitude above the ground. This is for you the sign that the quadcopter accepts your palm as a landing pad. Now pull the left control stick down for a long time until the Mavic Pro initiates the landing. Immediately after she comes up, the propellers turn off. If the Mavic pulls up again when you grab her, he has not previously seen your hand as an underground. Attention! Before catching the Mavic Pro with your hand, you should pay close attention to where the propellers are. It can be very painful when you reach into the spinning rotors. Be careful! It’s really fun flying the DJI Mavic Pro. But if you want to get yourself into the limelight, it’s better to shoot when you have your hands free. This is where the intelligent flight modes from DJI are used. With very simple programming, the Mavic Pro can independently perform specific maneuvers. I would like to introduce some of them in more detail here. Via the ActiveTrack mode, you can mark an object in the DJI GO 4 app. This motif will always be kept in focus. Depending on your settings, you can track the subject from any angle, circle it, or you can take control of it yourself and control the Mavic Pro to your own liking. In FollowMe mode, the DJI Mavic Pro follows your position and keeps a constant distance as you move. The quadcopter uses the GPS signal from your smartphone to do this. The orientation of the camera does not matter in this mode. If the drone looks away from you then it stays that way during the maneuver. With the Waypoint mode, you can automatically fly to certain locations in order. To do this, you maneuver the drone exactly to these places and save the desired positions. With waypoints, you can, for example, Record time-lapse. With the TapFly feature, you can tap a specific point on your phone screen and the DJI Mavic Pro will automatically fly to that location. This has the advantage that you have a very even flight movement. In this mode, you fly over a point and save the position. Then you remove yourself. At the push of a button, the DJI Mavic Pro circles around the point and ensures a steady rotation of the quadrocopter around the object, resulting in a wonderful video. Radius, speed, and altitude are customizable during the maneuver. In tripod mode, the drone flies slower and can be positioned more precisely. This helps you to capture the perfect selfie. Even if you are not seen on the recordings yourself, the flight modes help you produce phenomenal good shots that are otherwise very hard to realize. If you use the automatic flight modes with the DJI Mavic Pro, you must remember that the obstacle avoidance of the quadrocopter only works forward. So if the Mavic Pro flies sideways or backward, the sensors cannot detect any objects. So always make sure that there are no objects on the site or set the altitude high enough that the obstacles cannot be a problem. 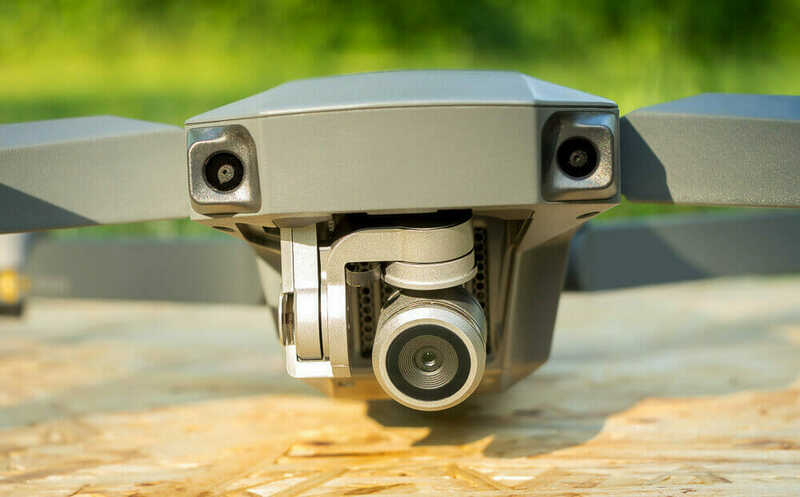 The camera of the Mavic Pro is, as we already know from the DJI drones, attached to a 3D gimbal (3-axis gimbal). Thus, no blurring in the footage must be feared. The gimbal makes the video recordings of the Mavic Pro buttery soft. For the target group of the Mavic Pro, these resolutions/frame rates are completely sufficient. If you need better camera settings for your projects, you should take a look at the DJI Phantom 4 Pro. Photos are saved at up to 4,000 x 3,000 pixels, equivalent to 12 megapixels. The DJI Mavic Pro can automatically adjust all camera settings. Of course, the settings for photos and videos (ISO, shutter speed, white balance, etc.) can be made manually. In order to get the most out of your recordings, you should study these possibilities intensively. A special feature of the DJI Mavic Pro is that you can rotate the camera by 90 °, so you can take pictures both in landscape and in portrait format. In our review of the DJI Mavic Pro, we made some example shots in the automatic mode. For this test, we did not change any camera settings and we did not use any filters. The footage we have put together in a short video, so you can get an idea of the recording quality. The color reproduction and the sharpness of the pictures really got me excited about the DJI Mavic Pro. Make sure that you focus on your subject beforehand (via the display or via the button on the remote control), so that the camera focuses on the subject properly. The DJI Mavic Pro is equipped with OcuSync, a new wireless technology that can achieve extreme ranges. DJI advertises with a range of up to 7 kilometers for the DJI Mavic Pro. Of course, this is a distance that nobody should use. After all, such distances are prohibited by the drone regulations in most countries. In a drone flight, you should always keep visual contact with the aircraft. We tested the range within a reasonable flight radius. Within the visual line of sight, you will reach no limits and you do not need to worry about disconnections. The range of the DJI Mavic Pro is perfect because of the sophisticated OcuSync. If our test helped you make a purchase decision, then you should know a few things about it. Currently, the DJI Mavic Pro you can buy the DJI Mavic Pro in different versions. In the standard version, you get all the accessories that you need to fly. DJI also offers a Fly More Combo package. This package includes two extra batteries, a car cigarette lighter adapter, a power bank adapter, a battery charger and a shoulder bag. I think this package is very worthwhile. Whichever package you choose, there is always only one miniSD card with a capacity of 16 GB included. That’s pretty little in my experience, especially if you want to record 4K videos. That’s why I recommend you to purchase a miniSD card with 64 GB of storage space in addition. For added security, you can also buy the DJI Care Refresh package. This is a kind of insurance or warranty extension. With the DJI Care Refresh Service Plan, you get a new aircraft if your drone gets damaged. Explicitly included are damage caused by collision, water damage, signal interference, user error or by dropping the drone. This gives you complete protection. Incidentally, the Mavic Pro can also be used with the DJI Goggles, an FPV goggle that lets you see the live image of the camera right in front of your eyes. The DJI Mavic Pro is currently probably the most popular camera drone on the market – and rightly so. My initial skepticism towards the small quadrocopter has dropped very quickly. The drone has first-class flight characteristics and the handling is very easy – also thanks to features such as ActiveTrack, Point of interest and Tap Fly. With the OcuSync technology, the image transmission over long distances in high quality is possible. With the FlightAutonomy including obstacle detection, you can fly confidently even as a beginner and you need not be afraid of collisions. The long flight time and the outstanding portability of the DJI drone is also a huge plus. I can only pronounce a clear buy recommendation for the DJI Mavic Pro. Do you also have a DJI Mavic Pro? Then rate the drone below this review and share your experiences with the drone. If you still have questions about the Quadrocopter, you can also leave us a comment. We are happy if we can help you! In your article, you’ve said that “Excellent flight characteristics with long flight time”. What if this drone will be lost because the owner lost sight of it? Do you have a feature or an accessory that was attached in this drone to track where the drone possibly fell out? It helps also to the owner save money to avoid buying another one again right? Usually, modern drones have a feature called Failsafe. With the failsafe mode, you can decide what happens when something goes wrong during a drone flight. With the DJI Mavic Pro, you have a drone, which flies back to the take-off position when you lost the signal. Also, you can command the drone with a button to come back to you when you cannot see the drone. I think this is the best option to prevent losing your drone. I don’t think it is necessary to attach a GPS tracker to the DJI Mavic Pro. When you only fly in sight you know where your drone is. The additional weight of the tracker may decrease your flight time a little bit. I never used such a device. For me if you are new to flying drones then it might be necessary to have a gps tracker with you. Although Francis was right, but still in my own experience, such circumstances happen like an out-of-sight crash. It’s better to prevent that from happening you know. Hi Logan! I really do think so that it would be necessary especially during bad weather. What tracker can you suggest just in case I’d be getting one? When flying my drone around unfamiliar places, I’d attach a GPS tracking device. One instance, it flew away due to high wind speeds and crashed but thanks to Trackimo, I got my drone in no time. What GPS tracking device is it? Yes I agree with Francis. It can affect your flight time a bit due to additional weight added to your drone but it depends on the tracking device you’re using. I’ve been using this device, Trackimo and never did it affect my drone’s flight time cause it’s very lightweight. hmm, I’ll try to check this device and also read more about it! They tell me it’s useful and functions better than others. Yep, also thought about that. I’ve been having troubles in retrieving my drone ’cause it always crashes due to battery power loss. Great review! Is it recommendable to new drone users like me? The DJI Mavic Pro is a very recommendable drone but you might want to consider some beginner drones for practicing before flying the Mavic pro, also a recommended tip for new drone users like you. Absolutely. Another good option for you is the DJI Mavic Air. Can’t wait to try this cool drone!